When opportunity tweets, tweet back. That may be the key lesson from young brother and sister entrepreneurs Scott and Stacey Ferreira, who recently landed nearly $1 million from Sir Richard Branson and Colorado venture investor Jerry Murdock for their startup -- when they weren’t even looking for funding. 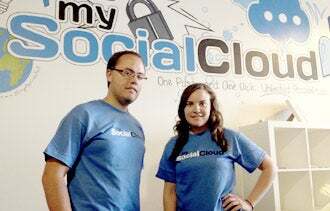 Stacey, 19, and Scott, 21, started working on their business, MySocialCloud.com, last summer. The web application, which is currently in beta, aims to be the go-to place for people to manage their internet activity and securely store usernames and passwords, among other things. Scott, who left the University of Southern California as a sophomore to pursue the venture, says he got the idea when his computer crashed and he lost a spreadsheet containing all his usernames and passwords. The now CEO decided to form the business after finding other password-storage sites lacking in one way or another. For her part, Stacey recently finished her freshman year at New York University and is taking a leave of absence from school. She worked on the business in Los Angeles last summer with her brother and the company’s chief technology officer, Shiv Prakash. 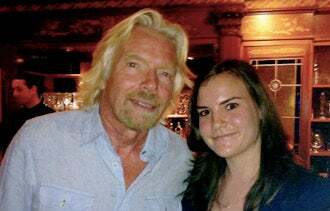 MySocialCloud founders Scott and Stacey Ferreira responded to a tweet from Richard Branson to meet the billionaire in Miami. Two months later, he became one of the company’s investors. “I was taking a break from working and I decided to check my Twitter,” says Stacey, adding that she didn’t regularly check her account. When she logged on, she saw a tweet from Virgin Group founder Richard Branson, who was offering a chance for people to fly to Miami and meet him for cocktails if they would donate $2,000 to his charity, Free the Children. The Ferreiras, who are from Scottsdale, Ariz., applied right away. Stacey e-mailed Virgin at the address provided on the tweet, saying she and Scott (who was 20 at the time) weren’t old enough to drink cocktails but would love to come to Miami and meet Branson, once a teen entrepreneur himself. After learning they were able to go, the pair secured a $4,000 loan from their parents. Just two days after receiving Branson’s tweet, Stacey and Scott were in Miami. There, they didn't sip cocktails but they did attend two parties at which Sir Richard himself was present. The siblings, says Stacey, were excited but not nervous as they met Branson at the first party at the Versace mansion. “He just walked in the room, and we just started talking. I didn't have time to think about being nervous,” she says. The siblings were among 18 people telling Branson what they were working on or about their life passions. "We gave him a little background on where we were from and what our service provided," Stacey says. After getting Branson's contact info, the pair returned to California and kept in touch with the billionaire. They also chatted several times over the phone with Murdock, a co-founder of Insight Venture Partners, a venture capital firm in New York. Murdock flew to L.A. in August to visit the company’s office and asked the Ferreiras many questions about themselves, the business and their vision. The next day, Murdock announced that he and Branson would invest in MySocialCloud.com. “It helped propel our business forward quite extensively,” says Scott who plans to use the investment mostly to support the nine people on his team. Scott believes that it helped that the company already had a functioning prototype in place. They were able to send links to Branson and to show the business to Murdock when he visited. In March, the young company received another investment for an undisclosed amount from Photobucket co-founder Alex Welch, whom Scott calls a good mentor. “I guess the biggest thing that I would advise [fellow young entrepreneurs] is take every opportunity,” says Stacey. How else would you suggest young entrepreneurs get ahead? Leave a comment and let us know.